Some Mac users may require the ability to erase a disk or erase a hard drive from the command line on Mac OS, a task which is typically performed through the Disk Utility application from the GUI. The command line approach to disk erasure in macOS is a bit different and it requires precise syntax to insure that you are erasing the proper disk, making this method of erasing any disk only appropriate for advanced Mac users. 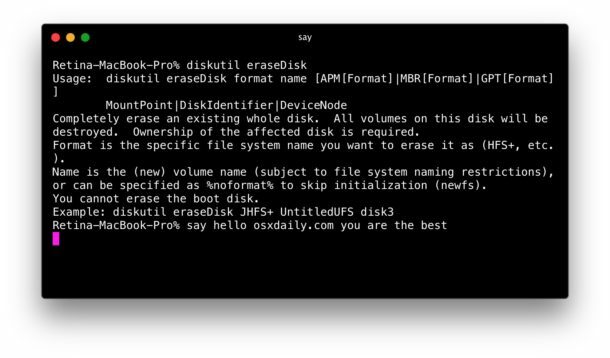 This guide will walk through how to erase and format an entire target disk using exclusively the command line on any Mac using macOS or Mac OS X. You can choose any common file system format the disk to after it has been erased, including ExFAT, FAT32, HFS+, or JHFS+. Notice that this is aiming to erase the entire disk from the command line here, this is not just erasing a volume or partition on the target disk. The entire target disk is erased, all data on the target disk is destroyed using this approach, with no volumes or partitions or any data remaining. Do not misunderstand that, otherwise you will inevitably permanently lose data when it is erased and destroyed. Remember the command line is unforgiving, if you are not comfortable at the command line it would be much more appropriate to erase and format a disk using Disk Utility in the standard interface of Mac OS X. To erase a disk from the command line on the Mac, we’ll use the familiar “diskutil” command with the eraseDisk verb and other appropriate flags to specify options for how we want to erase the disk, and to identify which disk is to be erased. It is absolutely critical that you use proper syntax when identifying the disk to erase. Improper identification may lead to erasing the wrong disk, permanently destroying any data on it. Do not screw this up. If you are unsure, you can find the disk ID node with “diskutil info “DISK NAME” |grep Device”. For some quick reference, here are a few examples of various disk erasure methods for different file system format types. As always, be sure you change the disk node as appropriate for your disk. Again, any of these commands erase the entire target disk and obliterates any data on it. Finally, it’s worth mentioning that if you want to erase the currently booted disk from the command line from this method, you’d want to do so from a boot disk or from recovery mode. Single User Mode alone is not sufficient to erase the actively booted operating system. Should the MS-DOS one use FAT32 instead of JHFS+? Or am I misunderstanding something? MSDOS should be FAT32 that is correct, looks like a typo. Thanks for catching that! Why publish such dangerous commands which might create disasters for the adventurous amateur. The spreading of knowledge should never be discourage. If “adventurous amateur” create disasters, then so be it. They will learn something from it. And no great disaster will occur. They might lose ‘everything important to them’. That isn’t a disaster. My story is I hand off USB and other older hard drives. I’m a photogrpaher. I’d like to be sure that previous data is gone. One way I was taught was to hard format a drive in Windows, then do similar in Mac, then again format in Windows, then add the data. For jpgs, this should elimant many software recovery options. My understanding of how your trying to do secure deletes: Picture a book that can have either a Contents(PC) or an Index(Mac). By switching Mac or PC formatted all your doing is choosing between “i want an Index/Contents” the pages in the book are all still there and can be easily read. As a bare minimum overwriting the whole disk 7 times is considered just about acceptable. There are free and commercial options for ‘secure erase’ – but there are also free and commercial versions of UnDelete, so do try some against each other if its important to you. Is there any speed advantage to this method over the GUI? No it’s the same erase process, it’s just handled through the command line rather than the Disk Utility GUI app. I have a question that is related. . . sort of. Why is Apple holding back from implementing a modern disk file system on their computers? The specs for one of these was offered to them (and basically everyone else) free of charge, quite a few years ago by Sun Microsystems. Would it have been simple to implement? Oh, probably not. Were any of the other file systems in use today simple to implement? I’m guessing not. Apple charges a higher than normal price for what I will admit is a higher than normal quality machine. I just think it’s time the quality of the filing system on the hard drive be brought up to Apple standards. The status quo doesn’t cover it and Apple has never been known to settle for ‘status quo’, anyway. So, please, put a few of your brilliant engineers on this, would ya? Failure should not be an option. Or, maybe you’re just waiting for hard drives to go away completely? Now, THAT’S an interesting thought. Apple is working on APFS, or Apple File System, but it won’t be used for at least another year. Maybe they will release new Macs in that time that could use it. Very recently, I came across a situation where Disk Utility could not erase the HDD. Under the strictest supervision from Apple, I was able to do this from the command line. As it was a Fusion Drive, I was then instructed on how to merge or fuse the two disks – SSD and spinning platter. It all worked perfectly in the end BUT this is NOT for the amateur or faint hearted. I second the question regarding the cute Terminal window featured in this article. In case you didn’t find it already, just go to the Shell menu, and select the Show Inspector. There are several alternative appearance settings. After this shows up in terminal..what do I do next to have it finally erased so I can use it again? This is what I see. This worked great, thank you so much for showing me how to erase a hard drive from the command line. Thank you very much. That helped me. Hi – Despite my double checking the list to identify the right dev to delete, I deleted a drive that had all of my photos. I have four drives in an external Stardom stack. I was having problems with a corrupted drive. Do you have any advice on how to retrieve the files? I have been working with testDisk, Data Rescue, Stellar, Cisdem and DiskWarrior. There is no way the files are gone; I did not run any kind of scrambling/security erase, nor write any new files to the drive. Thank you in advance for your any guidance with how to recover from this specific command. When trying to erase the disk it comes up with the message “Wiping volume data to prevent future accidental probing failed”. How do I continue? Thanks! Works on High Sierra since Apple’s new Disk Utility can’t do crap. Apple Devs are going down the drain these days! disk5s2 , which will also give me the device’s location (disk5), s2 refers to the volume/partition of the device disk5. diskutil list shows me that the problem volume is listed as disk7 to the system/gui/disk utility.app, but underneath it tells me its logical location of disk5s2… I’m happy now, because I really needed the device more than volume. erases all the partitions that appeared as one device in Disk Utility. Hey, thanks for the useful tip ! On MacOS 10.11.6 El Capitan, the Disk Utility refused to work in graphical mode for my flash drive (erasing was denied with “wrong name”). But the CLI way went alright ! I spent two days on it and found no solution. Please help me on this? My disk utility can’t read my ubuntu USB installer so I needed to format it using the terminal. Thank you, this helped me incredibly and made the rest of my job easier. I’m trying to format an external ssd 256GB hd that used to be the main disk in a Windows machine corrupted by a Virus. This is an article for Mac, it is erasing a hard drive from a Mac command line, it is not a Windows tutorial. You can, however, format a Windows hard drive from a Mac if you connect the Windows hard drive to the Mac and format it through Disk Utility, or the command line as described above. If you are having a hard time using the command line, try the Disk Utility app, which is simpler and uses the GUI. Who said that I was using the command line code in a windows machine? In fact, that commands wont work in windows. Someone have a better/more pro-positive and useful answer? Hey Luis, have you found a solution to your problem? I’ve been experiencing the same for the past two months, I’m about to lose it. I’m afraid I didn’t find a solution. I bought a new hd, and keeping the old one until find a way to format it. How are you going in your searching? What Terminal-App is shown on top of the Page? Thank you! This post is older, but incredibly relevant when you need it. I wish I’d found it before I wasted hours trying to figure it out another way. Again, thank you. The most helpful thing I’ve seen online in days. I’ve tried using the eraseDisk with and without “sudo” command but it always tells me disk2s2 could not mount after erase. Hello can you give the correct command line command to format a 16gb stick (/dev/disk2) into a Fat32 with MBR name can remain untitled. About how long should erasing the disk take?